What Does Deck Girder Mean? In deck construction, a girder (or "beam") is a board or a composite of more than one board that serves as a supporting structure for the deck joists, which meet it perpendicularly. 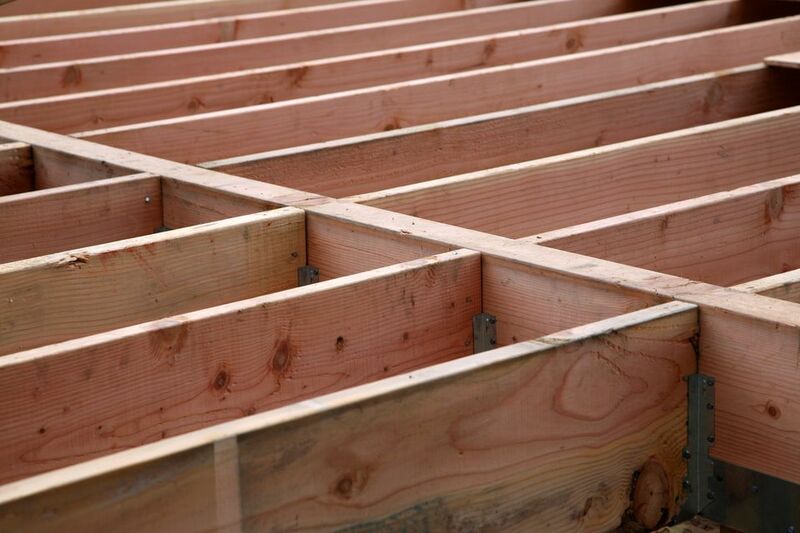 When building a deck that will be adjacent to a house, joists are often attached at the house end using a header board (from which the joists are "hung" using joist hangers), keeping the tops of the joists at the same level as the header board. At the opposite end, support is provided by a deck girder. Rather than being hung from this deck girder, the joists commonly rest on top of this beam. The deck girder, in turn, rests on posts for support. Likewise, a large deck may need extra support in the middle. You can supply this support by sinking posts into the ground, then running a beam along the tops of these posts. The beam will parallel the girder at the one end of the deck, and the header board at the other. The joists can rest on top of this central support beam or be connected to it through the use of joist hangers. What Is a Header Board (or "Ledger")? When building a deck that juts out from a house, the deck is usually tied into the house structurally. To achieve this, a header board or "ledger" is bolted to the house. The header board is one end of the deck, and the deck at this end derives support from the house. This board will be the same width as the deck joists. The joists will be hung from the header board using joist hangers. A joist hanger is a metal framing connector, which, after being screwed into the header board, provides a slot for one end of a joist to rest in. Again, the joists meet the header board at a right angle, and the tops of the joists are at the same level as the top of the header board. It is important to establish this level properly early on in a deck construction project since it provides the surface for the floor of the deck. You will be screwing this floor, or "decking" to the joists. Once you comprehend this fact, it is easier to understand how critical it is to keep header board and joists at the same level. When building a deck that will not be adjacent to a house (a so-called "floating deck"), there will be a deck girder at both ends of the deck for support. Indeed, even when the deck is to be adjacent to the house, an alternative construction method is to use a second post-and-girder system rather than tying the deck directly to the house via a header board. The joists will rest on these two deck girders, and the decking, in turn, will sit atop the joists. Knock on Wood: Are Composite Decks Superior? Is Biennial the Same as Biannual?